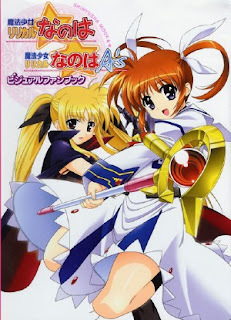 Mahou Shoujo Lyrical Nanoha follows the story of Takamachi Nanoha, a human girl who is able to transform into a Magical Girl using a pearl known as Raising Heart which allows her to use magic powers through a staff. The purpose of her being able to transform is to help someone called Yuuno Scraia fulfill his mission to seal away Jewel Seeds which have been spread around the world accidentally after he failed to seal a Jewel Seed. Nanoha has a similar start to Madoka Magica, in the sense that it takes a few episodes before the story gets better. At first you see different characters from another world(s), some of who seem to be connected to Nanoha in some way, but you don't get to know them other than by name as they're introduced in the battles you see in the first two episodes. This is the anime's way of setting the scene before things really progress, but if you're willing to persevere with the slow start, it's worth the wait. After an unexpected event near the end of the second episode, episode three takes the opportunity to explain everything to you before things become interesting halfway through the episode, as the two Magical Girl groups strive to achieve their goals. Despite the slow start, Nanoha is an enjoyable fantasy-based anime with action and a good story. If you've seen and enjoyed Madoka Magica, you'll be a fan of this too.